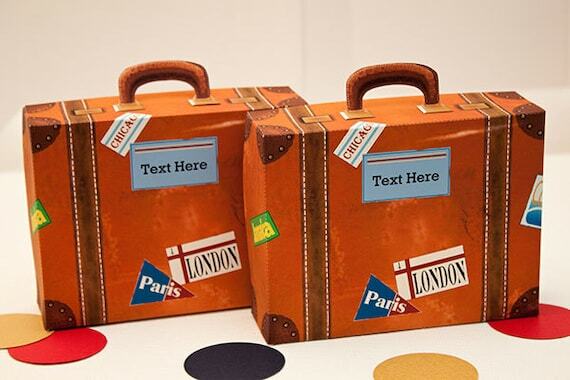 Grab this lil' suitcase to carry your party favors across the world! 2. After payment has cleared, follow the link Etsy provides to the Downloads page. eCheck payments will delay your order by 3-5 business days. 3. Download/save the file(s) to your computer upon receipt. The latest version of Adobe Reader is required to open our files. A free download of Adobe Reader is available at www.adobe.com. 4. Etsy will also send a download notification email to you. If you don't receive the notification, check your spam or junk inbox. No physical items will be shipped. 5. Print at home or send to a print shop (e.g., Staples, FedEx Office, etc.). Print as many as you need for PERSONAL use. Depending on your screen's resolution or the printer you use, colors may vary slightly. 6. Cut and assemble using the included directions. Have FuN! This file is for PERSONAL USE ONLY. You may not mass produce, share, sell or distribute the file(s) or the finished product(s) produced. All products are for non-commercial use. All files are copyrighted and password protected. You may not alter the artwork or designs in any way. Copyright privileges are not transferable. All rights retained by Piggy Bank Parties. [EVENT PLANNERS]: Please see shop policies for one-time commercial use. [NOTE]: You cannot change the font, font size or font color. Follow us for party inspiration, product updates and tons of fun!